Last Dezember I was sitting in a new Boeing 747-8l on my way from Frankfurt to Mexico City for the christmas holidays. After more than 12 years traveling back and forth between Mexico an Germany, finally Lufthansa has upgraded the aircraft for this route. One main difference to previous planes is that every seat ist equipped with its individual inflight entertainment system. The Entertainment program is very broad now, which is good news. To my surprise, this “new” 747 8l Jumbo, which was delivered to Lufthansa in 2012, uses still a very old technology to deliver its content. It a world where almost everyone is traveling with an iPad or its equivalent, it feels like flying back in time. I just refuse myself to get “entertained” by this old technology, and below I explain why. First, the quality of the touch screen is the worst experience ever. Except for my back. The passenger sitting behind me need to press his screen so hard, that I can feel every touch command in my back spine. Nice finger massage neighbor! Second, the sharpness of the display is worst than any touch device I ever used, ever! Contrast and brightness, all terrible. Finally, and most frustrating of them all: the software. Do I still need to see a mouse arrow every time I make a click like using my first 1992 Pc? I am sure this software was designed for desktop stations, then adapted for a touch environment. The entire system is damn slow and unresponsive. Of course sand clock was there, appearing every time by every command. What a waste of precious inflight time. Despite been stuck 12 hours with this crippled entertainment system, almost everyone in the plan is using it! 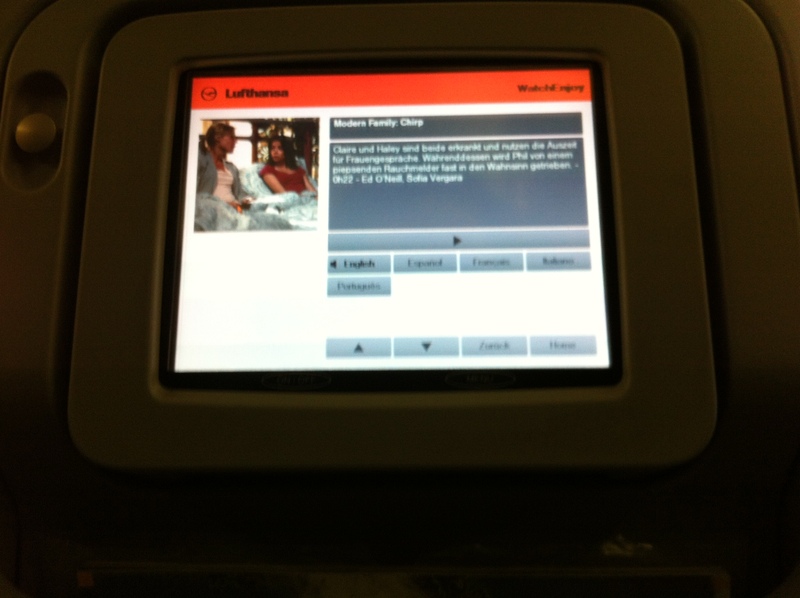 Of course is an individual display much better that having one screen for the entire airplane section as before. But in the area of tablets and smartphones, I refuse to watch any new film on this outdated screen (did I just forget to mention about the horrendous quality of sound it has?). Imagine an iPad-like device. This plane has already wifi-hotspot ready (which I find amazing and have tested for the first time). The possibilities are endless. How to afford such a device? simple: Lufthansa could either rent it (traditional revenue model) or better, offer it for free and add advertising to it. You can also charge extra for wifi use. Fortunately, I have my iPad Mini with me. And because I do like to get properly entertained, I am using my device only despite the lack of good content the inflight entertainment system has to offer. I just can´t stop but to think about the lack of vision of airlines in this particular subject. You have the attention of up to 467 customers locked in for 12 hours in a extremely reduced sitting space and all you have to offer is a current and broad content program been delivered through an outdated, crippled and frustrating medium. What a wasted opportunity. You are currently browsing entries tagged with touch technology at Guerson Meyer's Blog.